Now available at the Disney Soda Fountain and Studio Store, (no, not pins for a change) The Sweetheart Keychain series. 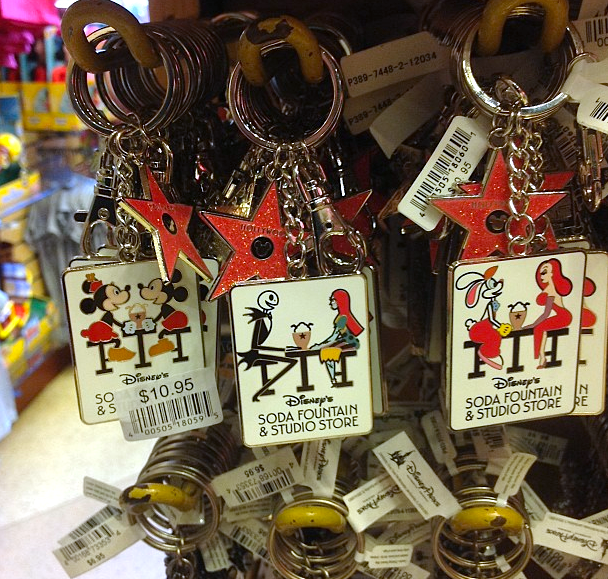 The three keychain couples in the series are Minnie & Mickey, Jack & Sally, and Roger & Jessica. Each couple is on their own separate metal keychain, but all of them come with a pink glittered star which says "Hollywood" at the top, and a Micky icon in the middle. Roger and Jessica Rabbit are lucky enough to have their own keychain - Roger sitting on the left and Jessica on the right - as they share an ice cream soda. The design of the characters is quite different. All of the couples have a sort of retro or "simplified" design about them. There is also a Disney Soda Fountain logo in black at the bottom. They sell for $10.95 each.